Diagnosed at only 14-months of age, Fernanda has never known life not being sick. Fernanda, feeling the holiday spirit! My heart was opened this fall to the story of Fernanda’s journey, a 14-year old girl with cystic fibrosis. Fernanda and her family shared their story this fall at a benefit event for There With Care, a Colorado-based nonprofit with a San Francisco Bay Area chapter in Menlo Park, California, that offers ongoing practical and emotional support to families facing serious illness. Diagnosed at only 14-months of age, Fernanda has never known life not being sick. Her life has always been filled with hospital visits and medications. Step back and imagine what it must be like for this family who uprooted their lives to live closer to Lucile Packard Children’s Hospital Stanford and await the chance to receive a double lung transplant. Separated from her husband by nearly 500 miles because he needed to stay back home to work in order to provide funds and insurance, Fernanda’s mom, Mayra, has had to face these challenges with only the support of her children. Not only is Mayra in charge of Fernanda’s medical care and home-schooling, but she also had to care for her other two young children. We know that a family like Fernanda’s requires a circle of care to support the emotional and physical needs of the entire family. We applaud There With Care for providing just that—whether basic things like grocery deliveries, clothing, and cleaning supplies, or much more elaborate support such as Thanksgiving dinner and Christmas gifts. The organization also helped repair Mayra’s car so she could get Fernanda to and from the hospital for treatment. 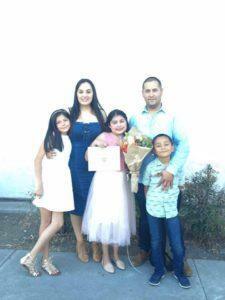 After 18 months waiting, Fernanda received her match for the double lung transplant! That was the first miracle –now Fernanda continues her miraculous recovery as she regains her health and strength. She was recently able to say goodbye to the wheelchair that had been donated to her through There With Care? What did Fernanda do? She donated it back to the organization for the next person in need. Thanks to a generous There With Care’s donor, Fernanda’s family was recently able to fly from San Diego so that everyone could be together during the holidays. In the New Year, Fernanda plans to tour Facebook, one of her dreams since coming to the San Francisco Bay Area for treatment. We encourage our Digging Deep community to visit Fernanda’s Facebook page and send her a message for the New Year. Happy New Year and New Life, Fernanda. You go girl!